Melvyn Bragg and his guests discuss the dawn of the European Iron Age, a period of great upheaval when technology and societies were changed forever. 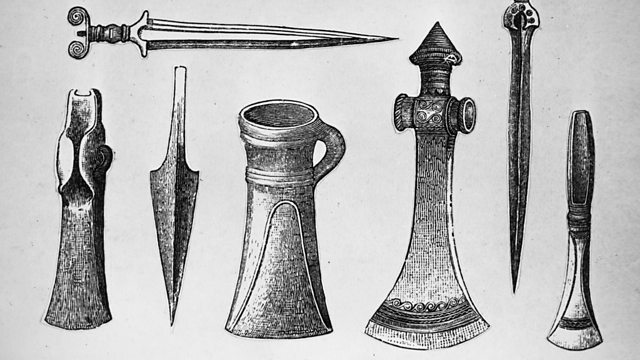 Melvyn Bragg and his guests discuss the dawn of the European Iron Age.In around 3000 BC European metalworkers started to make tools and weapons out of bronze. A complex trading network evolved to convey this valuable metal and other goods around the continent. But two millennia later, a new skill arrived from the Middle East: iron smelting. This harder, more versatile metal represented a huge technological breakthrough.The arrival of the European Iron Age, in around 1000 BC, was a time of huge social as well as technological change. New civilisations arose, the landscape was transformed, and societies developed new cultures and lifestyles. Whether this was the direct result of the arrival of iron is one of the most intriguing questions in archaeology.With:Sir Barry CunliffeEmeritus Professor of European Archaeology at the University of OxfordSue HamiltonProfessor of Prehistory at University College LondonTimothy ChampionProfessor of Archaeology at the University of SouthamptonProducer: Thomas Morris.